Today seems the perfect time to talk about the benefits of weekly meal planning. It’s a miserable Monday here in the middle of the UK. From my dark kitchen, through the window, I can see unrelenting rain being soaked up by my water-laden lawn. Weekly meal planning is without a doubt one of those activities whereby putting aside a little time to sit down with pen and paper is a great return on time invested. The first point is very close to my heart. For many years I have been keen to learn how my family and I can reduce the amount of food that we waste. When you set aside time for weekly meal planning, the objective is to identify what meals and additional food is required within a 7-day period. This reduces the temptation to buy additional items that do not fit inside the plan. If they aren’t planned for, why should you need to buy them? If you do buy items that may (or may not) be required, then anything that is perishable potentially may go to waste. When you waste less food, you save money. It goes without saying doesn’t it? Maybe you do not spend less overall on your groceries – but what you buy you use. This can take some getting your head around. Whenever I buy something I do not need, or will not use – I replace that item in my mind’s eye with the value of the item in hard-cash. Can you see it too? So rather than an avocado going in the compost, I see £1 (or equivalent value) being tossed in the bin. This is a good trick to play on the mind. Alternatively you may well spend less overall – I know I do when I meal plan. No tempting impulse purchases make it into my basket with no predetermined recipe, or meal, in mind. What busy Mum doesn’t wish for more time? I know I do. It feels as though I watch the clock day in day out. There’s an anecdotal equation that states that for every minute spent planning you save 10 in execution. Could this really be true? 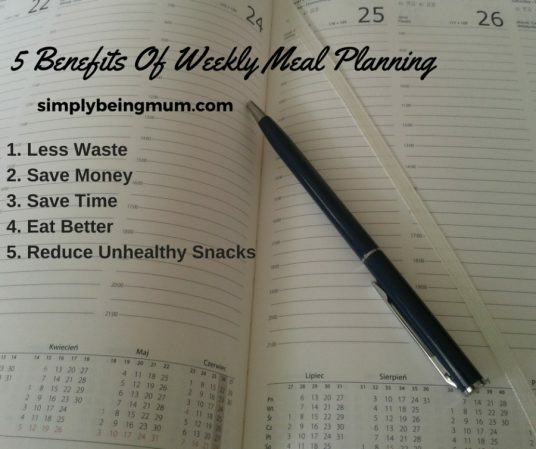 That 10 minutes weekly meal planning could easily save me over an hour and a half each week? I believe this to be so. Making decisions as to what to eat on the spur of the moment, not only takes up more time that having a set meal in mind, but can also lead to poor food choices being made. Decision making is never a good idea on an empty stomach. Eradicate room for weakness by knowing what you are eating that day. As already touched upon above, weekly meal planning can help you to eat better. Planning meals in advance (on a full stomach!) can help to make meals more nutritious and balanced. I like to take time to consider the combinations of food groups that will end up on our plate each day. A priority for me, as a Mum, is to ensure my family eats to serve their bodies needs not just their taste buds – but it’s great when the two come together – and weekly meal planning means this is much more likely to happen. By eating better we can reduce snacking. By buying less – snacking can also be limited. Healthy snacks have their place, and a bowl of fresh fruit, or a selection of chopped vegetables in the fridge is a good idea. But when reaching for the biscuit tin between meals is the go-to option then if weekly meal planning can reduce this then surely it is a huge benefit. Consuming empty calories, that purely serve as a spike in blood sugar, and have little nutritional value should be seen as a treat, not staple food. The less you have in the cupboard, and the less variety of those types of snacks you have, the less someone will snack – it’s been scientifically proven. If you haven’t got it, you can’t eat it – no need for willpower in that circumstance. What other benefits do you find from weekly meal planning?